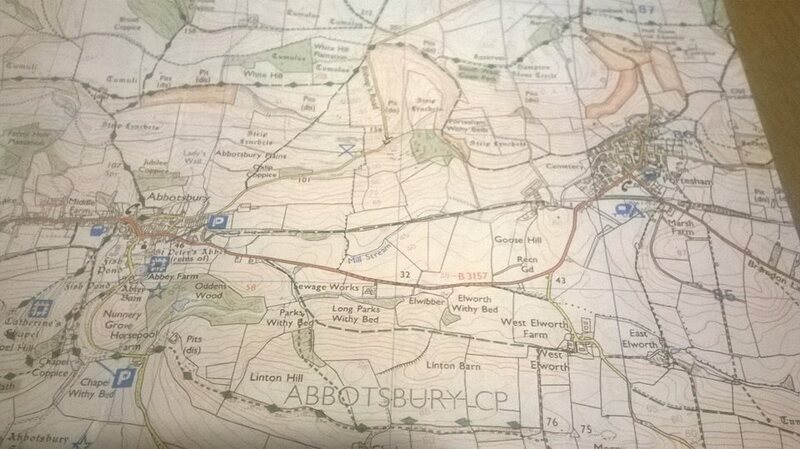 Abbottsbury Station was at the end of a branch line running from Weymouth, with the branch junction being at Upwey. The station opened in 1885 and the line finally closed in 1952. There was a station halt at Coryates and a station at Portisham. The line continued from Portisham and terminated at Abbottsbury. There was a single platform at Abbottsbury, which is still there. A house and garage have been built on the site of the station yard and platform. To the east of the station is the old goods shed and the old track-bed forms a public footpath to Portisham, approximately one & half miles walk. Boots advisable. Further down the line towards Portisham stands the old engine shed. It has two overgrown walls still standing. The platform at Abbottsbury, looking west into the station. The platform is still intact, overgrown and built on. Track bed leaving the station eastwards towards Portisham. Engine shed to the east of the station. Previous Oil company ordered to restore South Downs drilling site – DRILL OR DROP?